Did you know that Nick Cave has an office in London which he visits every day from 9.00am till 5.00pm for the sole purpose of writing lyrics. This dedication to his craft is testament to the quality and care he brings as the leader of The Bad Seeds. The Bad Seeds latest release is a double album, which was recorded in Paris and mixed as Dave Gilmour’s Astoria Studios. Beautifully packaged with a lavish booklet containing photographs and lyrics, this double CD is the follow up to last years Nocturama. “Messiah Ward” has the unmistakable commanding vocal that could only ever be Nick Cave. This track features the very welcome input of the London Community Gospel Choir. The bluesy guitar of Mick Harvey soaks up the atmosphere with typical panache. You’re enthralled immediately by the curiously unusual lyrics and intelligence at work here. 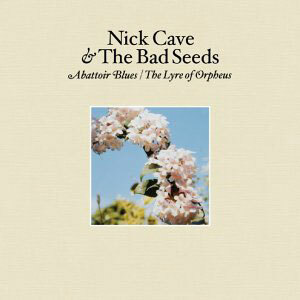 Title track “Abbatoir Blues” has the drums very high in the mix as Cave creeps in on the piano. Again the gospel flavour is thankfully still with us. Sombre in tone but a bit of grower. What’s often missed from critics when assessing Cave’s work is his sense of humour. The dour Australian comes up trumps yet again when he croons “I wanted to be your Superman, but I turned out such a jerk”. “Fable Of The Brown Ape” has Cave sounding uncannily like fellow songsmith David Byrne. Nick’s storytelling skills go from strength to strength on this intriguing tale of poetic beauty. There’s certainly the feeling of the calm before the storm with the drama in full effect. The second of the two CDs is the mellow “The Lyre Of Orpheus”, which is one hell of a mighty title. The title track that opens the album is high on lyrics, but low on a memorable melody. That said, you hang on to every word of Cave’s lyrics on this stirring musical journey, it’s more like poetry set to music than a traditional song. The whole tune could easily be from a rock opera. “Babe, You Turn Me on” has a strong country influence while Nick puts in an unexpected spoken word performance. The old fashioned melody is quaint and gently with smooth guitar and keyboard playing. This could perhaps be a bit tongue in cheek, but even if it is, it’s still wonderful. If there’s a more prolific songwriter around at the moment then I’ve yet to discover their work. It’s a long time since I’ve heard such a complete double album. There isn’t a single filler track on this, and I don’t use this term lightly, Masterpiece. This two-disc collection could be one of the best albums I’ve heard in the last 5 years.